Welcome to the Real Fast Results podcast! This episode should be very useful to you, regardless of the type of business you have. Most people have to have systems and processes in place that allow them to stay consistent each day in their business. Today’s special guest, Scott Beebe, does a great job explaining how to systematize business processes, and he is well-qualified to do so. Scott is the founder and head coach over at MyBusinessOnPurpose.com. He’s also the host of the “My Business on Purpose” podcast. 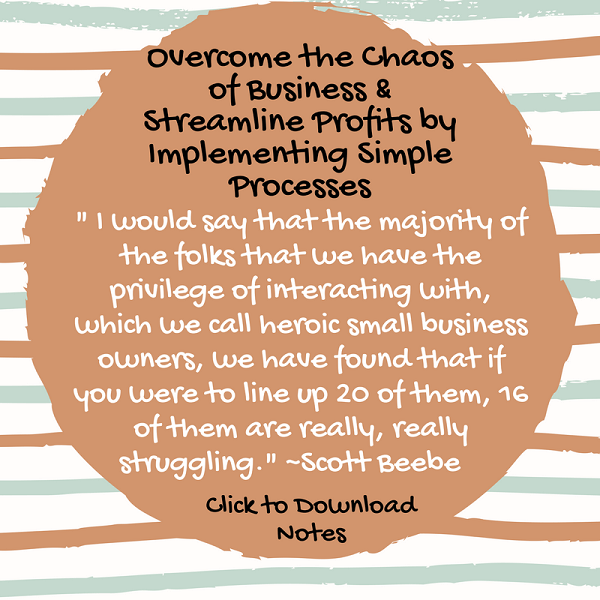 I would say that the majority of the folks that we have the privilege of interacting with, which we call heroic small business owners, we have found that if you were to line up 20 of them, 16 of them are really, really struggling. You’ve probably heard the saying, “The emperor has no clothes.” Metaphorically, these 16 business owners who are struggling have no clothes, but they are too afraid to come ask about it. The reason why we call these business owners heroes is because, by definition, a hero is someone who makes a brave decision and then takes courageous action. When you start a small business, that’s essentially what you’re doing. So, if you’re a small business owner, you feel like you’re in chaos, pulled in 17 directions, constantly putting out fires, and feel like you’re on a treadmill, and like you’re working in your business, not on your business, this is the place for you to be. I am going to show you step-by-step, methodically how to fix these problems. Just go straight over to MyBusinessOnPurpose.com/Vision. Just put your email in, and it’s right there. You don’t have to wait for six emails to get dripped out over seven days, or any of that kind of stuff. It will come straight to you. You just need to decide, right away, when am I going to do this? Because, if you don’t it’s just going to flutter away like anything else. If you are diggin’ on this stuff and really love what we’re doing here at Real Fast Results, would you please do me a favor? Head on over to iTunes, and make sure that you subscribe to this show, download it, and rate & review it. That would be an awesome thing. Of course, we also want to know your results. Please share those results with us at https://www.realfastresults.com/results. As always, go make results happen! Daniel Hall is a bestselling author, speaker, publisher, nurse, attorney and host the Real Fast Results podcast. He is also the creator of other highly popular “Real Fast” brand of training products. He left law practice 10 years ago to build his publishing business and has never looked back. Daniel is a true serial entrepreneur and his list of URLs is longer than a piece of paper, so you can check out Daniel’s hub at www.DanielHallPresents.com or the podcast right here on this site! Get 8 Free Profit-Packed Tutorials From Daniel Hall! Daniel on How to Write Your Book Even If You Have Disabilities With Nina G.
Get Your Real Fast Result Swag!